StoreWALL is your premium heavy duty slatwall provider. Not all slatwall systems are the same and neither is the quality of the wall panels themselves. Whilst most slatwall providers use natural fibres such as wood or a wood composite, StoreWALL is PVC based. StoreWALL is designed to be core coloured – its colour is distributed throughout the actual wall panel. The benefit is that its a heavy duty slatwall with unparalleled protection against scratching and damage. StoreWALL's slatwall's are the same colour deep inside as they are on the surface. Therefore any scratches, dints or chips are a lot harder to see and much easier to conceal. Being PVC based its also very durable, will not retain moisture, will not change shape nor will it generate mould. Our slatwall panels are also recyclable and easily cleaned. Each Heavy Duty Slatwall has a thickness of 17.7mm. StoreWALL's heavy duty slatwalls are really easy to install whether your are doing it yourself or using an installation specialist. The range of panels come in 4 colours including: Graphite Steel, Rustic Cedar, Global Pine, Weathered Grey and Brite White. Please note that our standard stock is Weathered Grey and any other colour will need to be a special order. Our Heavy Duty Slatwalls are designed to complement and enhance your stock if you are using them within your store. Used in conjunction with our hooks and shelves you display area will always look clean, tidy and attractive to browsing customers. Equally at home in garages and children’s storage areas, StoreWALL is flexible enough to be used almost anywhere you require shelves, storage or displays. Maybe inferior is a little harsh, but much of what is sold as slatwall panel is much less durable and usually lightly painted to provide a colour finish. Once scratched or dinted however, the internal grain shows up clearly and the slatwall finish and clean look is ruined. StoreWALL's flexibility and durability make it an excellent choice where materials such as MDF or wood products just will not last the distance. These surfaces are also quite likely to warp in shape, split, chip, or crack. When you are looking for a Heavy Duty Slatwall you would expect to have to pay more than an inferior alternative. 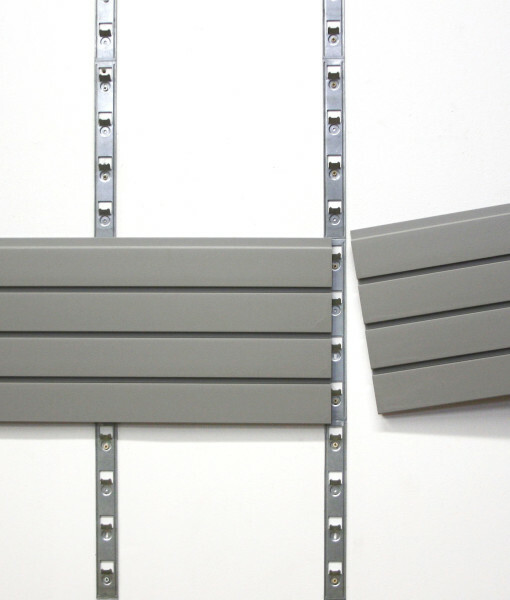 StoreWALL offer wholesale pricing to installers and clients that wish to purchase in bulk. Our prices are all displayed on our website so you can compare them yourself.